Compared to earlier this year, the team is more comfortable that inflation is less threatening in EMs after rates rose. "Our exposure to EMs is constantly reassessed. 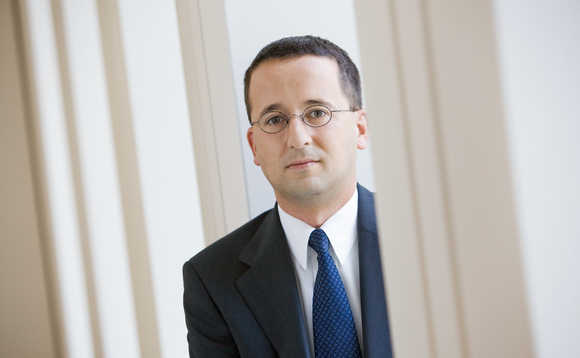 But right now, we are at the high point," says Bernd Poegel (pictured), head of fund research. "The end-client still thinks they are risky. But among banks' consultants, there has been a change brought on by the crisis in Japan, the eurozone and the US. A lot of people view China, Russia and Brazil as more stable at the moment." The team cut equity positions in each fund of funds before August's turmoil, and prolonged duration as "a natural diversifier". Poegel says: "Currently, our focus is on a balanced country allocation with a focus on the US and Europe, and additions from the emerging markets. This defensive stance has proven to be beneficial in the last days. "Our defensive approach was ­further highlighted during the first days of August as we have ­experienced markets that seem to ignore fundamental data, and seem to focus on revolving themes." The team has been cool-headed, despite lower ­valuations across many markets. "Even under the aspect of a long-term ­investment horizon, uncertainty about the ­direction of the stock market indices and the ­widespread fear about ­fundamental questions regarding the global ­financial system [have] kept us waiting on the sidelines." In asset allocation, the team thinks strategically over nine to 12 months, but since 2008 also tactically, more than three to six. DekaBank's team often uses derivatives for shorter-term ­exposure. It also takes into account a manager's optimism or pessimism to broadly match its in-house top-down view on a market. It also analyses managers and funds quantitatively and qualitatively. Statistics provide some insight into how a manager might perform, and fodder for questions in meetings. Poegel says investment data from the financial crisis is of limited use in judging managers "as there were so many factors no one expected, from volatility to liquidity. I do not want to select a fund ­manager just because in a crisis, he will behave in a particular way. Why have someone like that now when I want to make a nice yield for investors?"